1. 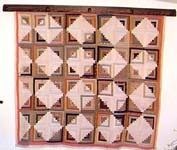 Log Cabin - 1860 - 68" x 76"
Sunshine and Shadow pattern - 1860 by Abigail Hannan. Started in the Sioux Territory in Nebraska and pieced on covered wagon trail to Walla Walla, WA. Family still lives in Walla Walla and are/were musicians and teachers. 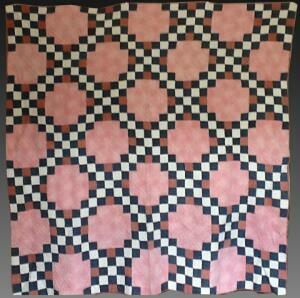 Quilt is made from double pinks, browns, madders, blacks, reds and shirtings of the early to mid 1800's. Back is feedsacks and so are the bindings. Small repairs on back but not through the front. 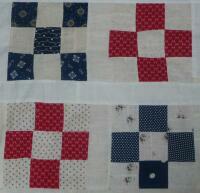 2 places where mouse holes had been - reconstructed with period fabrics. Bought in Nehalem, OR in 1997. 2. 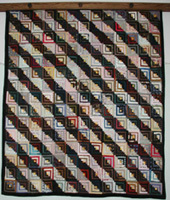 Log Cabin - Barn Raising - 1890 - 64"x 64"
This is a stunning late Victorian Log Cabin in the "Barn Raising" pattern that is organized into radiating diamonds. Its elegant fabrics and strong graphics distinguish this graphic beauty made of silks and velvets. The outside border is embroidered around each separate piece making it even more unique. Maker is unknown but was found in Massachusetts. 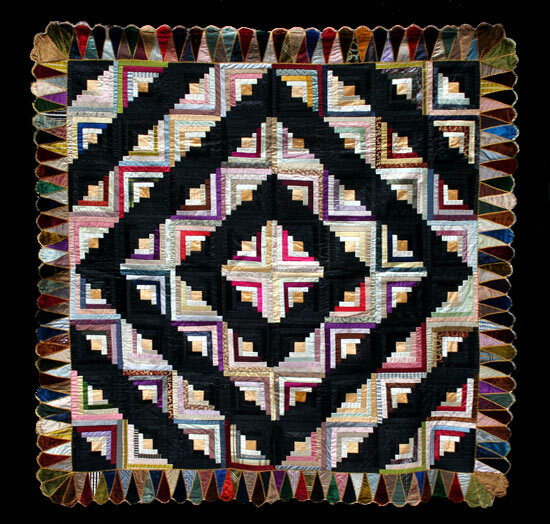 Josephine Arland of Washington state made this quilt mostly from silks plus some taffetas, brocades and velvet fabrics from the late 1800’s. It consists of 195 – 5” blocks made of 17 – ½” wide strips into each log cabin block. 4. 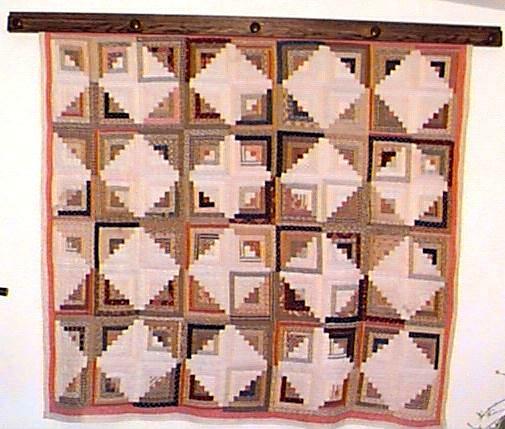 Nine Patch - 1860s-1890s - 60" x 80"
A double pink print and yellow calico set the mood for these on-point 6-inch blocks with excellent interior brown scrap-basket prints. 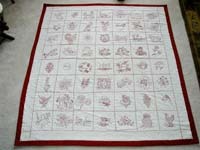 It is entirely hand-pieced and well-quilted at 8-9 tiny stitches per inch per side. The backing is in sections and there are some marks along the fold lines and a small mend. Purchased from Cow Hollow Collectibles at rubylane.com. 5. 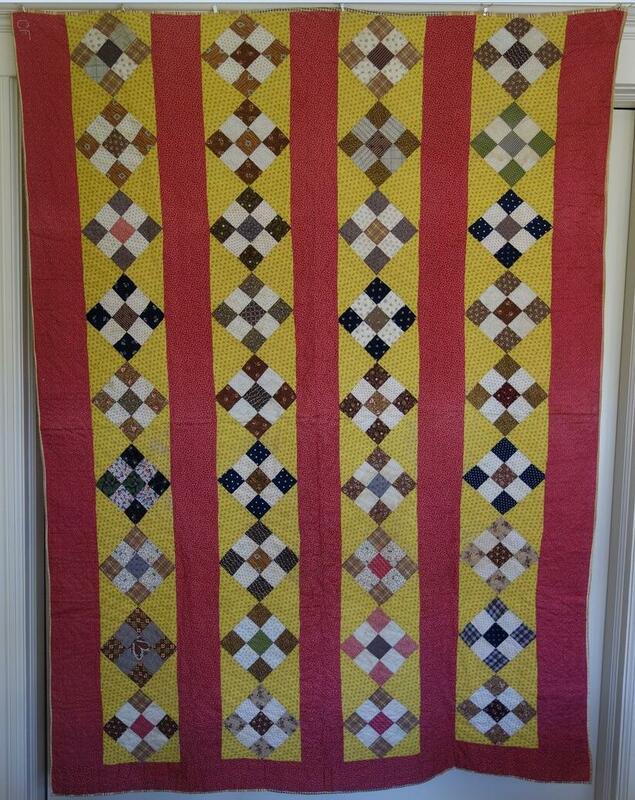 Redwork Quilt - 1905 - 65" x 72"
Made by a friend of the family of Zetta Timkins in Kansas City, MO. for her wedding Nov. 22, 1905 as seen in bell block. Found in a trunk in the basement when she died. Both her father and husband were named Harold plus the names of Lorena for her mother and Zetta for the bride. 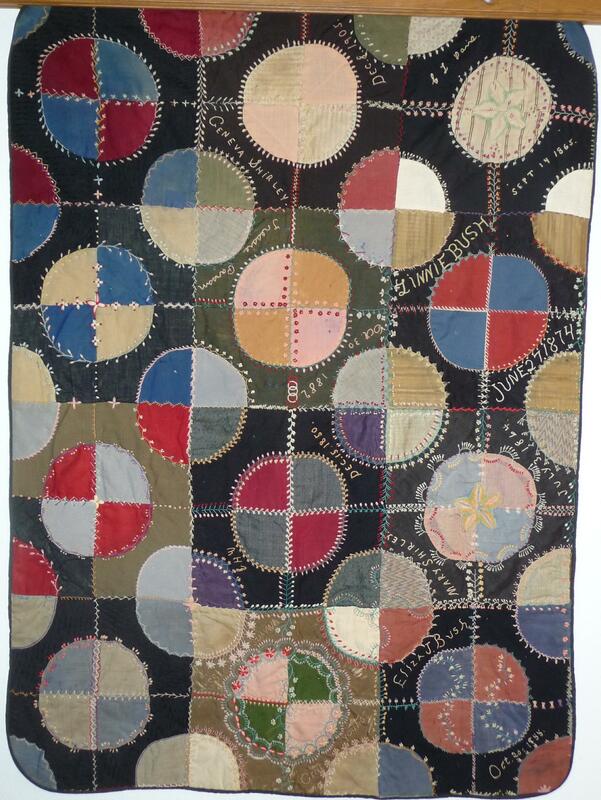 The husband Harold was killed in WWI and they had no children so the quilt was given back to Lorena's friend who then passed on to her daughter. Many Kate Greenaway motifs plus a Jumbo the elephant block who was such a crowd pleaser in 1905 are included. 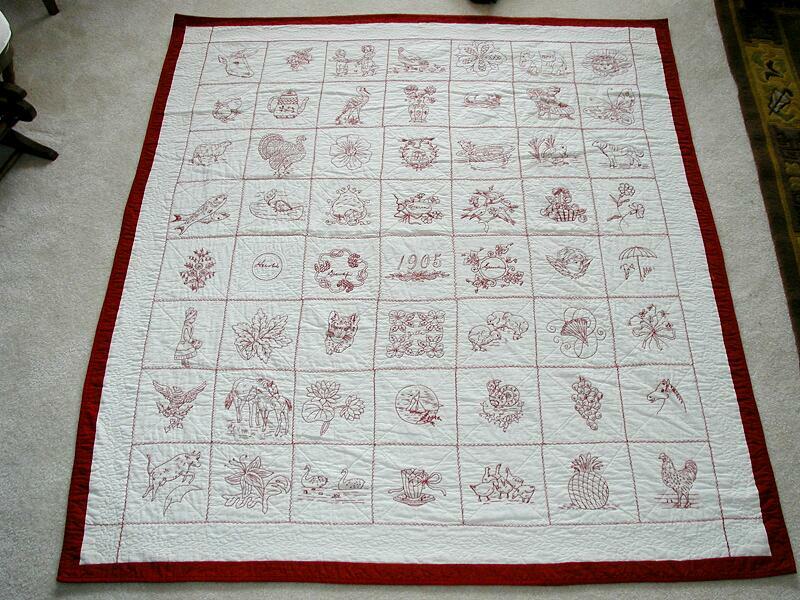 Composed of 56 blocks with a 4 inch wide muslin feather border, hand quilted and hand pieced. 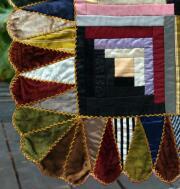 The hand quilting is 12 stitches per inch. 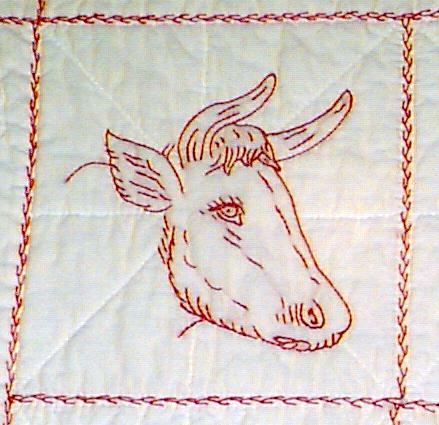 Each block motif is outline quilted and then each block is outline quilted. The binding is 1” wide Turkey red and back is muslin. 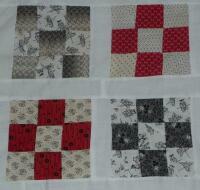 The blocks have been hand pieced together with feather stitching. Maker is unknown. 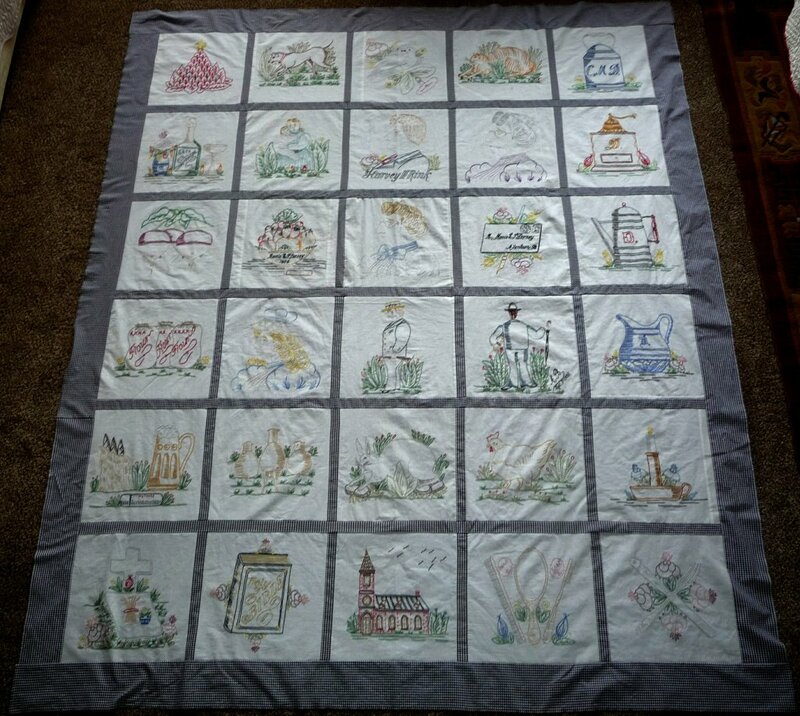 This wonderful unused and unwashed sampler quilt is entirely hand pieced and quilted, 7-8 even spi with a very thin cotton batting which would have been a summer spread. Several small blood pricks are in the one block on the edge and otherwise in pristine condition. 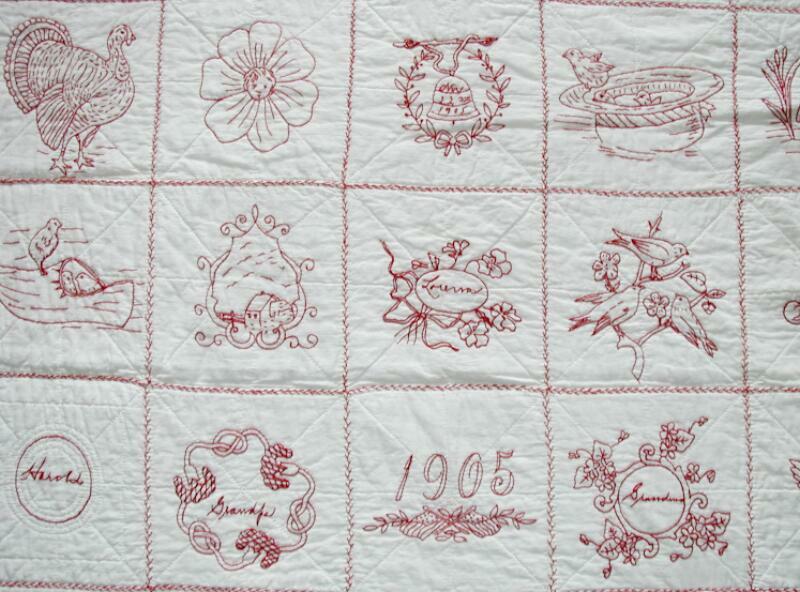 Made by Anna Hatch who lived from 1838-1926 (see blocks A and H). 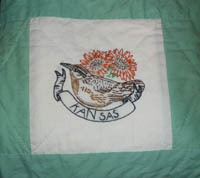 She lived in both Ottawa and Kansas City, MO so the quilt could have been made in either city. 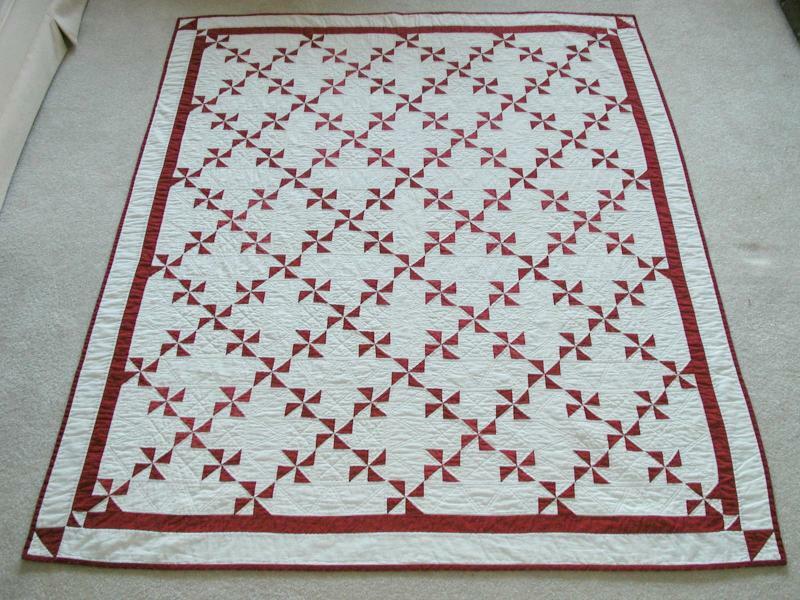 This monochromatic quilt consists of 3” square pinwheel blocks set into framed Nine Patch Blocks which are assembled into a mock Irish Chain layout. 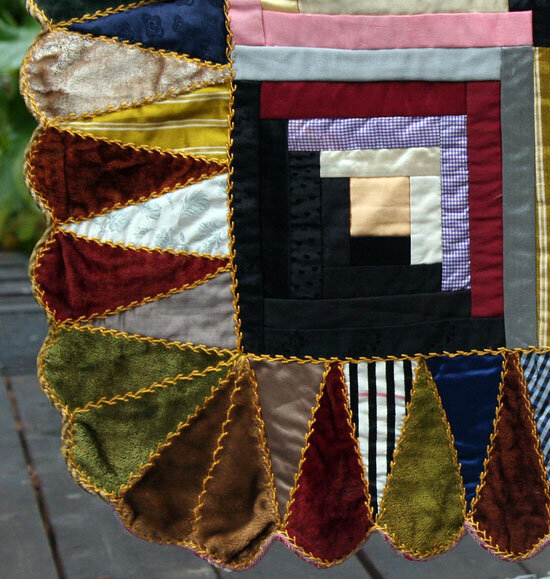 The quilt is exquisitely hand pieced with the tiny points having razor sharp precision. 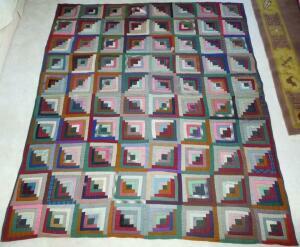 The hand quilting is done in a geometric style which is rather unusual. Made by Charlotte Randell of Portland, OR in the 1940s. 9. 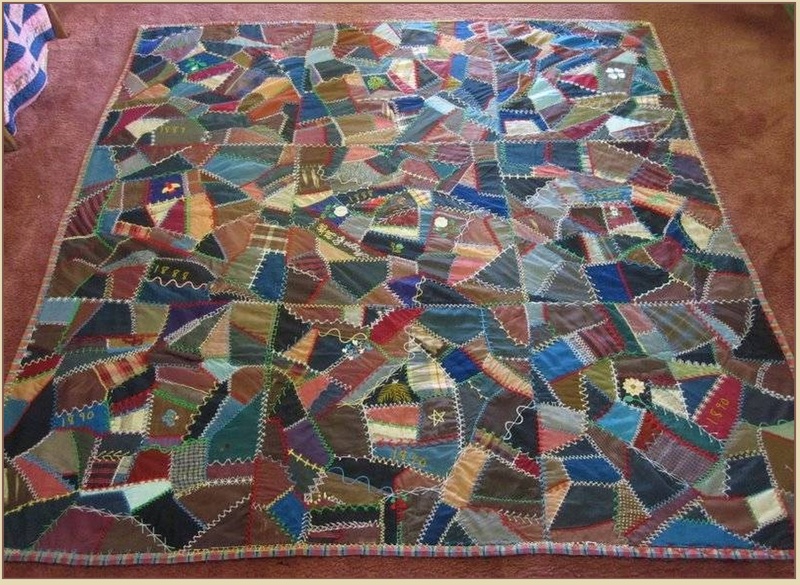 Magic Vine Quilts - late 1930's 74" x 83"
Designed by Florence LaGanke Harris as the Nancy Page syndicated quilt patterns which were published in newspapers. The first of these was shown in the St Louis Star Times in Sept 1930. (27 different designs were published under the Nancy Page name.) I have the actual newspaper clippings of the patterns. 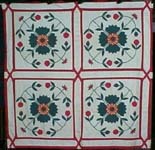 This 1800's Irish Chain quilt has fabulous quilting in a 5/8" grid with 11-12 even stitches per inch. It is entirely handmade with paprika, navy calicoes, white and double pink fabrics and a loosely-woven off-white backing with a thin hand stitched separate binding and no damage or repairs. 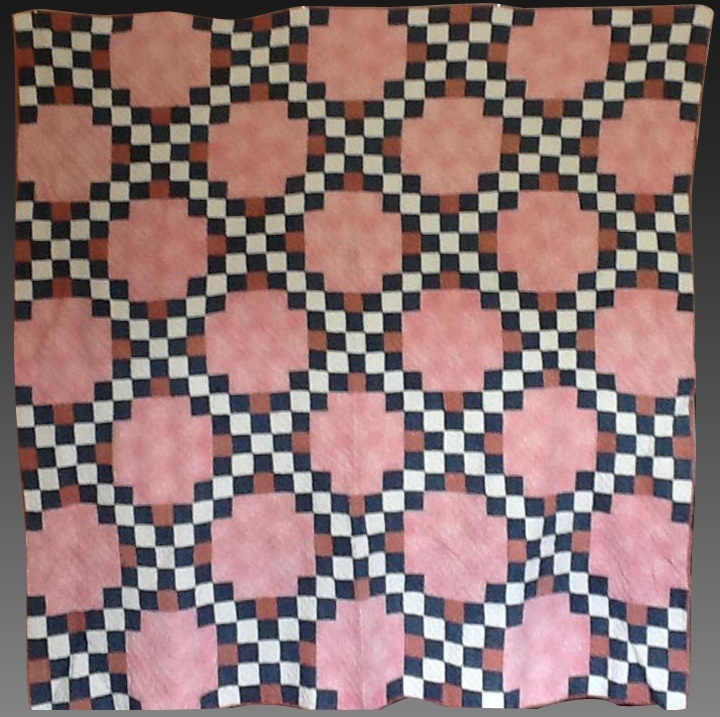 It is just a great old quilt with pretty colors and the double pink fabric is different than most with light and dark blossom “bouquets” set on a mottled pink ground. 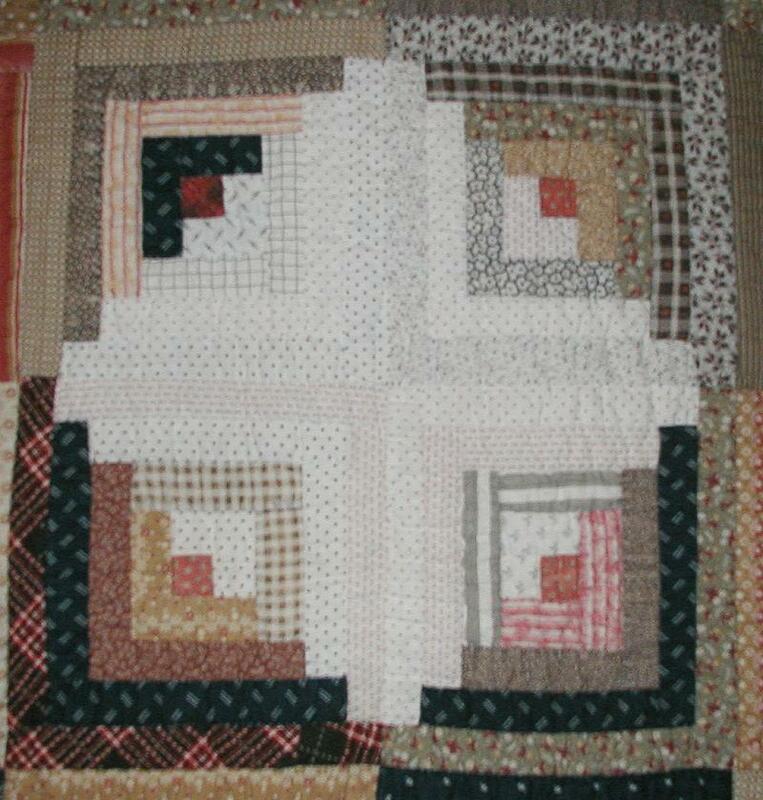 This delightful and exquisite small 12 block quilt and 2 block pillow has embroidery excellence bar none. 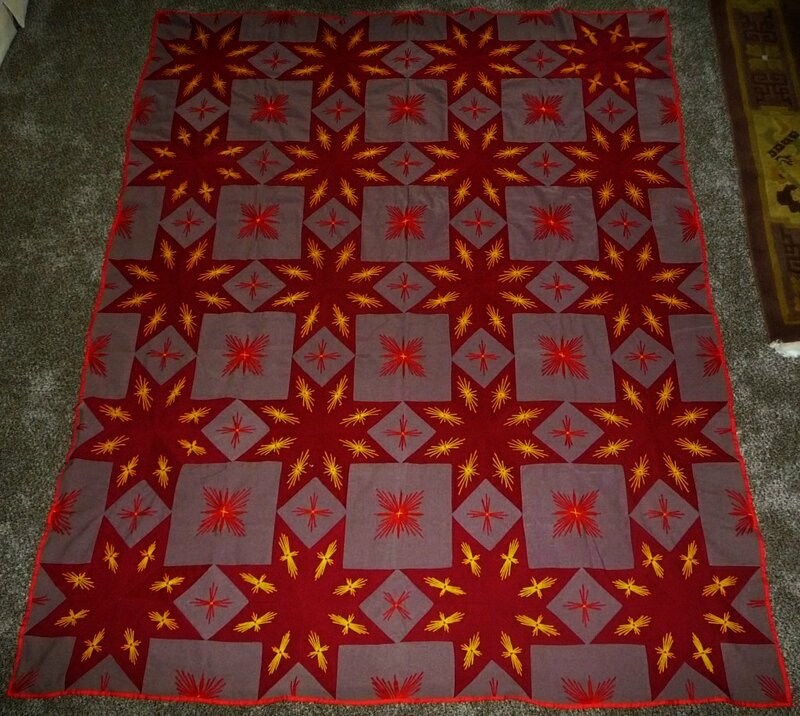 There are even two stump work stars in two of the 40 blocks in the quilt. It commemorates the family and friends from Perry Township and Colfax, Clinton County, Indiana. 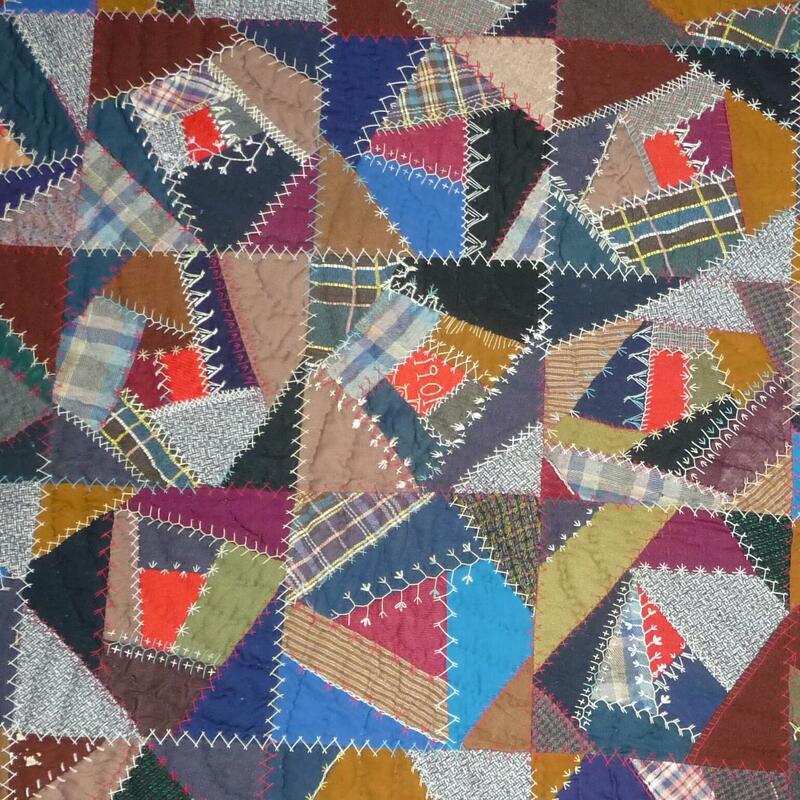 Stump work was popular in the 1930s which helps date the quilt. The eight names and their birth dates (confirmed by U.S. Federal Census status records in 1880 thru 1930 and Plainview Cemetery records) are listed below. Geneva Shirley Young - December 8, 1905, Perry Township, Clinton CO, IN. Father was Eugene Young and she was the grand daughter of Mary Shirley and Gene Young. Geneva carried her grandmother's maiden name - Shirley - as her middle name and her grandfather's first name - Gene. Many are buried in Plainview Cemetery, Clinton Co, IN. 13. 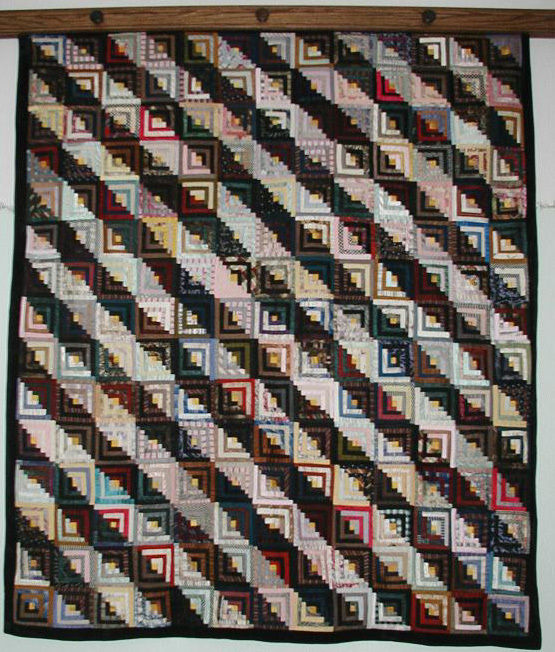 Trip Around The World - 1900 - 66" x 74"
Entirely hand pieced and quilted in 1-1/2" diagonals 8 even stitches per inch,. 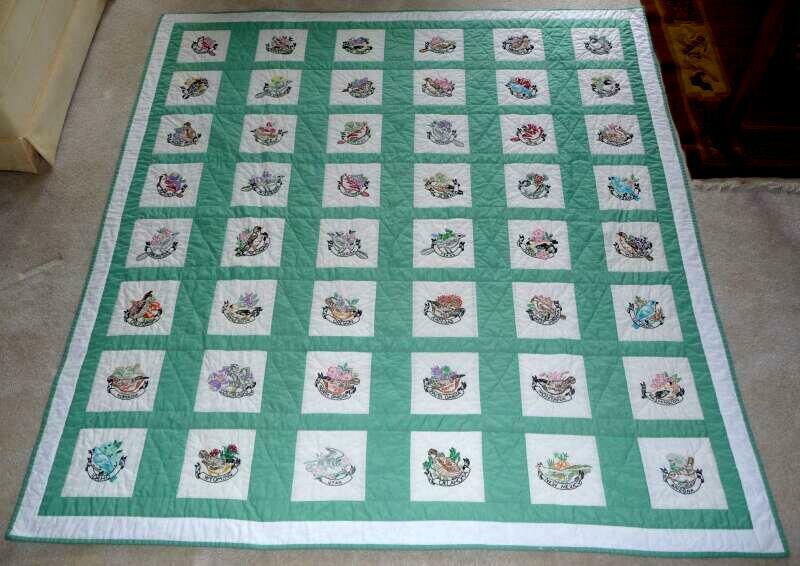 This charming little quilt is in very good condition. 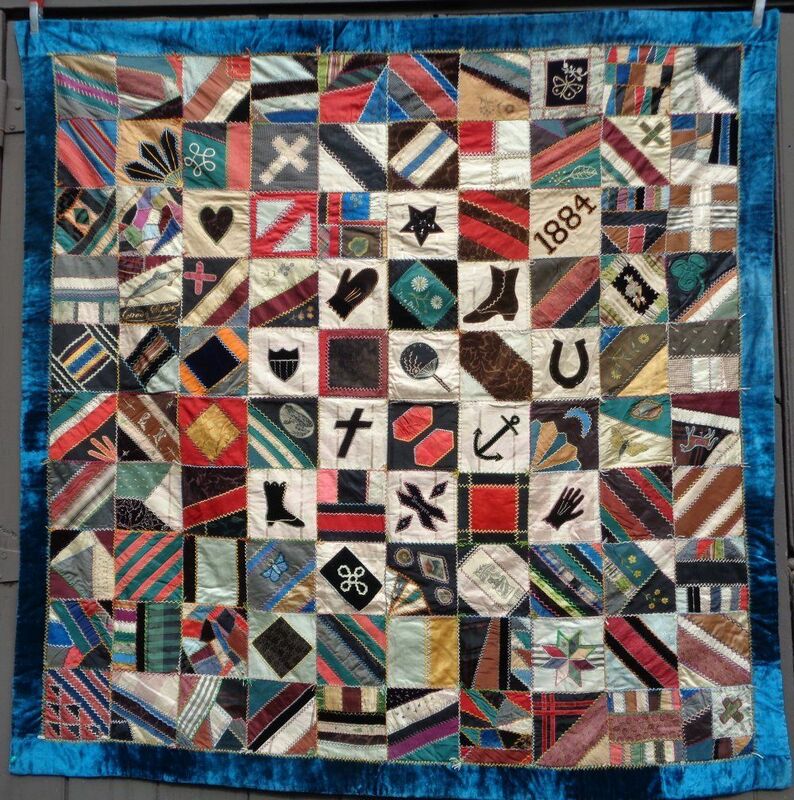 The colors are strong with indigos, cadet blues, mourning prints, shirting fabrics, etc The piecing is accurate with the 1 3/4" squares, the batting is thin and the 1/2-inch separate binding is the same striped backing as the reverse. 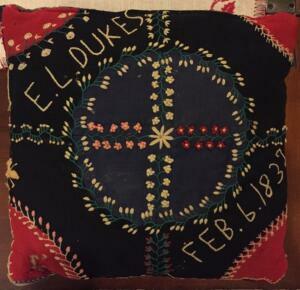 The quilt's maker is Flora McCormick (1851-Feb. 20, 1953) of Pittsburgh, PA. 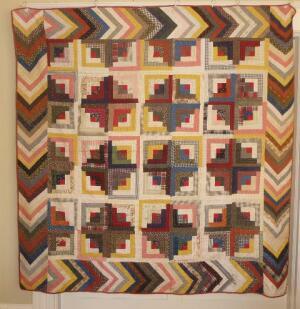 Pieced fabrics form long rectangles to border the block and added leaf border. 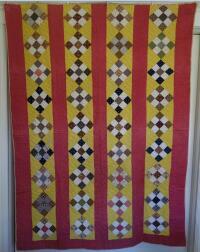 2 yellows are in this quilt; the border a warm butter yellow and the body is lighter. 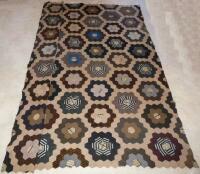 It measures 80" x 96" and is in excellent condition with no rips, tears, holes, fraying, stains or odors. The colors are still nice & vibrant with lots of feed sack fabrics along with other 100% cotton fabrics that are mostly in floral prints and pretty pastels. There are blues, pinks, reds, yellows, greens and oranges. 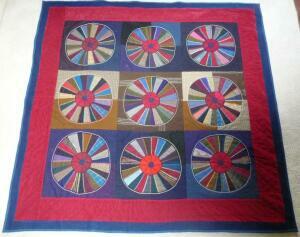 Appliqued, pieced and hand quilted with 9-10 top stitches per inch. . Each "ring" consists of 16 different prints. 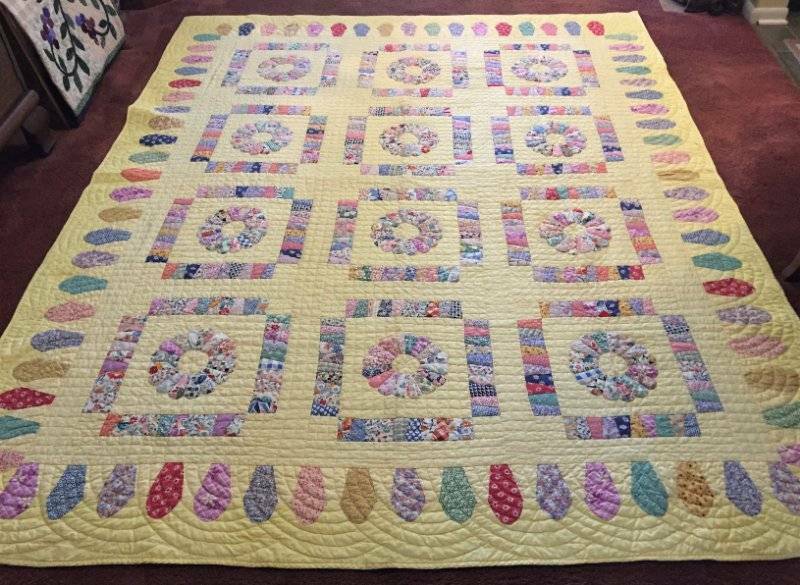 The centers are quilted in a smaller flower ring design, the yellow background is quilted in a grid design and the border was quilted in a shell design. It has medium weight all cotton batting. 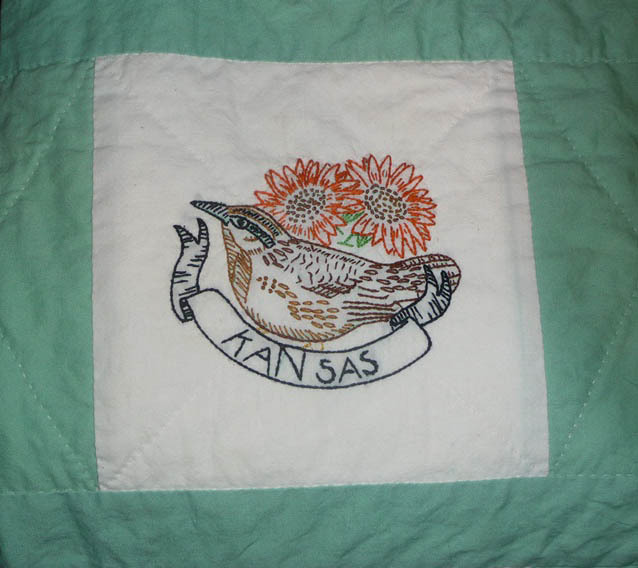 The Golden West Quilt, by Mary Erckenbrack, was originally published in The Kansas City Star newspaper in the 1930's. 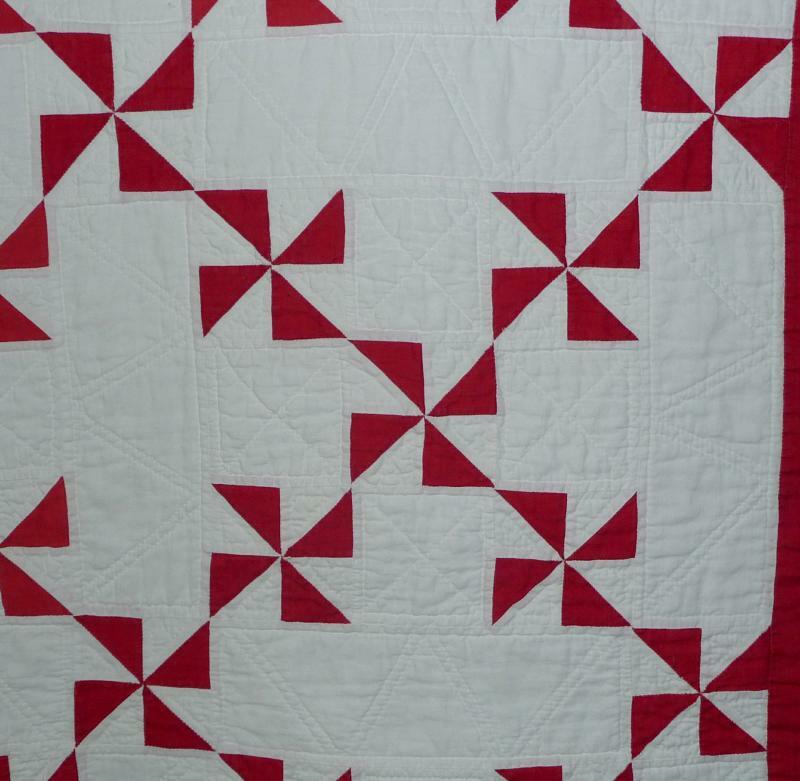 One pattern was printed each week, and the reader would carefully cut and save each piece until they had a complete quilt set and then copy with pencil onto muslin 6" blocks. 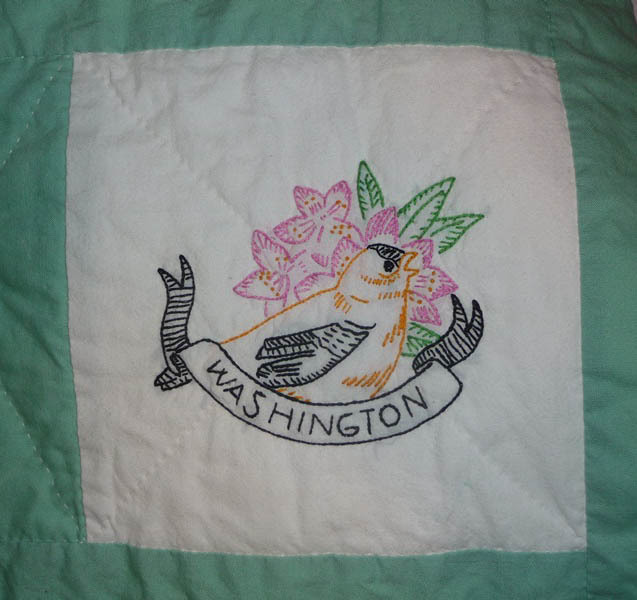 These patterns were highly valued, many of them surviving for collectors and quilt historians of today. The pattern consists of 24 designs. The familiar setting sun - emblem of the west - is number 25. 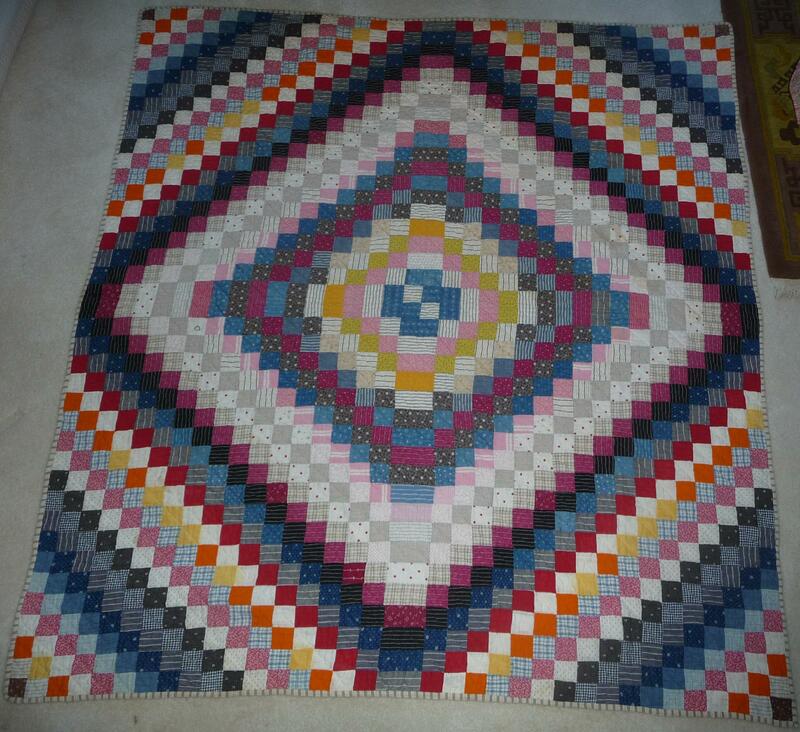 It is 45" sq with the 8 setting sun blocks surrounding the 24 different designs and 1 more setting sun. 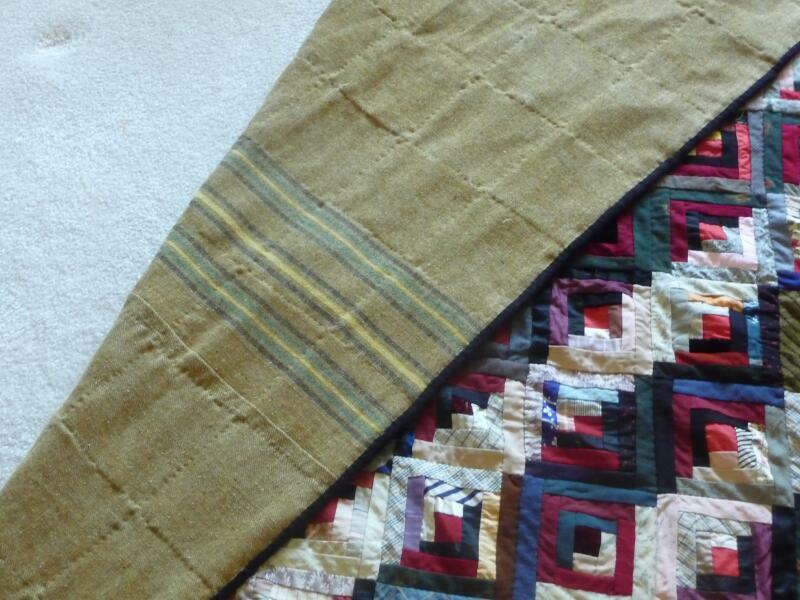 Sashing and borders are made from light hop sacking/homespun fabric dotted with specks of brown. 16. USA State Blocks - 1930's - 70" x 80"
This has all the 48 continental US states with each state's bird and flower plus name. Sashed and bordered with 1930s Nile green fabric. 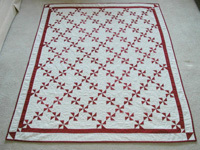 The white inner border has been hand quilted with a feather pattern and hand quilted at 8 spi. around each state motif and block. This was a much damaged top composed of men's suiting fabrics. 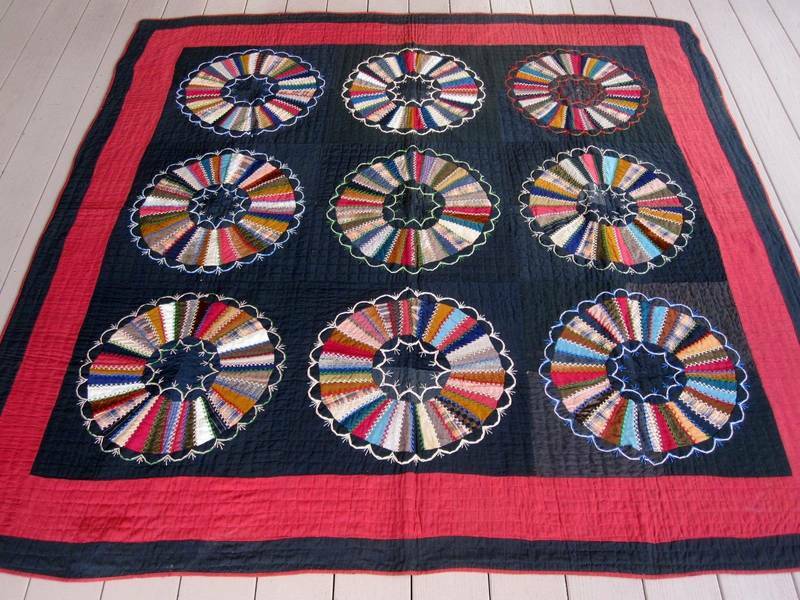 It was originally a completed quilt that had been ripped apart leaving only the exquisite embroidered top. The edges were uneven and jagged and it was no longer square. In order for it to be finished, it was necessary to trim the edges to make the corners meet which left bits of the discarded embroidery still intact. 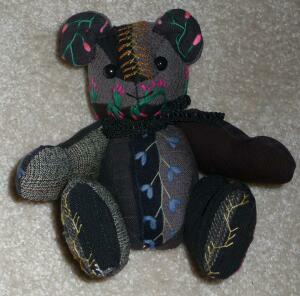 The pieces were then appliqued to leftover bits of the wool suiting and fashioned into an 8 inch articulated teddy bear. 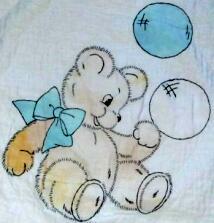 Therefore the bear and quilt will remain together. 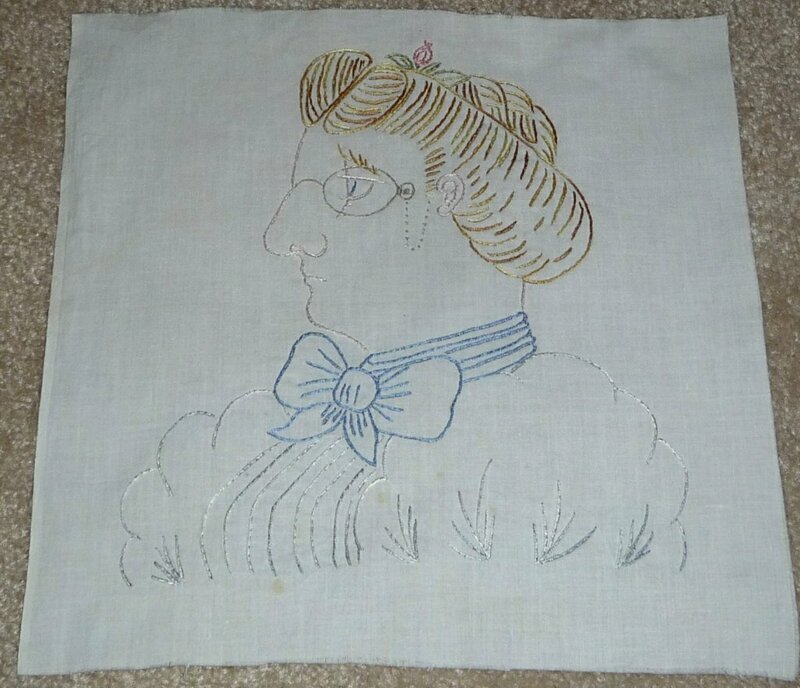 The original seamstress probably worked or a relative did at the Thomas Kay Woolen Mill in Salem Oregon and used 5" x 7" rectangle sales samples as the background for the embroidery. The T. K. Woolen Mill produced the first bolt of worsted goods west of the Mississippi in November 1896. The embroidered crazy stitching joining the blocks is exquisite and is executed in wool yarn and pearl cotton and cotton floss. There are many moth/silverfish holes and some have been crudely as well as expertly darned/repaired. There is no batting and the back is a grey and black plaid flannel with a black cotton grosgrain binding. 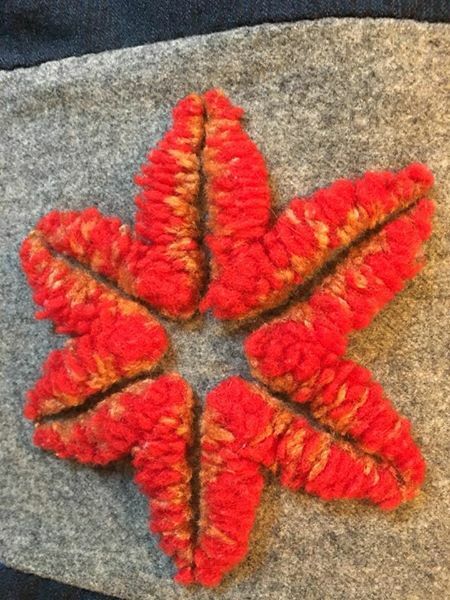 The damage is not paramount but this was preserved as a testament to a master needle worker's wanting to create something of beauty with exquisite skills and using wool scraps to do so. Quilt restoration/completion and teddy bear finished by Judi Fibush, Rocklin, CA, 2015. 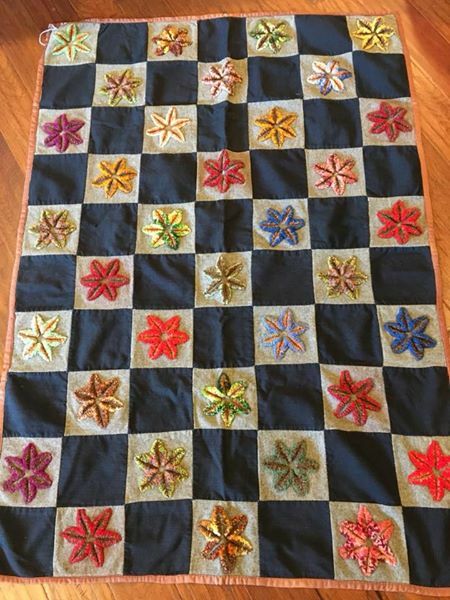 This lovely quilt has embroidery and applique plus multiple choices of fabrics, such as: wools, velvets, heavy cottons and velours. The background backing for the wagon wheel/Dresen plate designs is made of many different textured black fabrics and the quilt back is a green striped cotton flannel. 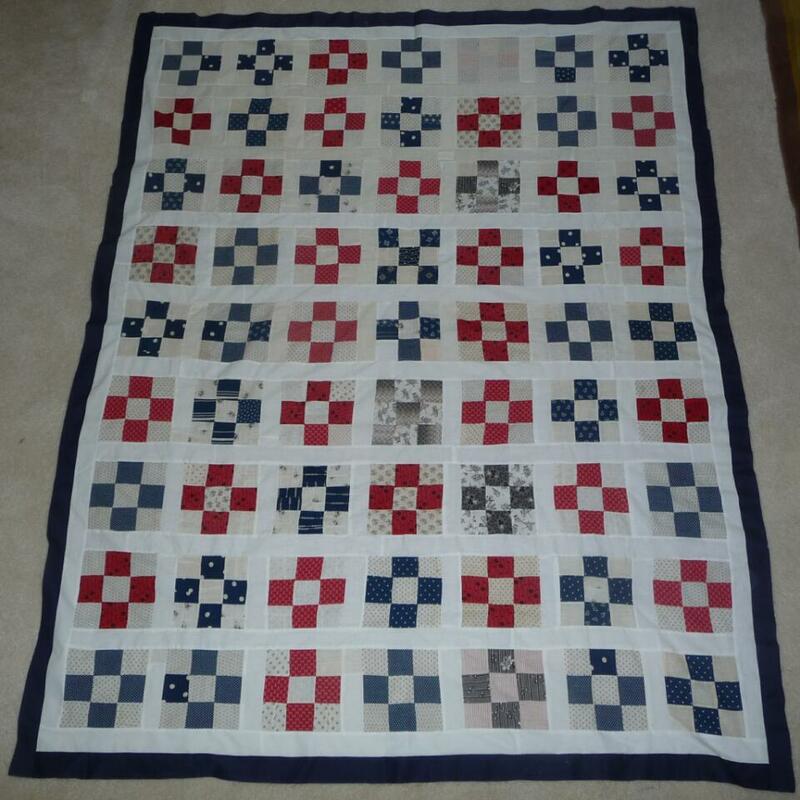 It is quilted in a 1" grid design at 9 spi. 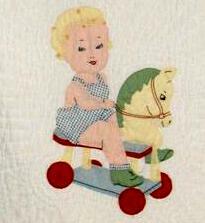 It was made by Laura Ellen Ohl Broede (Dec 13, 1872 to Dec 8, 1938) in Bloomville, Ohio. Her ancestors came from Germany in the mid 1800s and settled there. Her granddaughter - Ireta A. Dentinger - inherited it from Laura. early 1900's - 77" x 81"
Wools from late 1800's and early 1900's plus velvets, brocades and a few flannels with a chamois red flannel back and invisibly tied with black button hole thread. 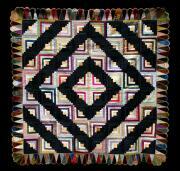 This Log Cabin quilt was made by Lucy Briggs of Lake Oswego, OR. It is composed of wool, velvet, flannels, silks and cotton fabrics of the first decade of the 20th century. 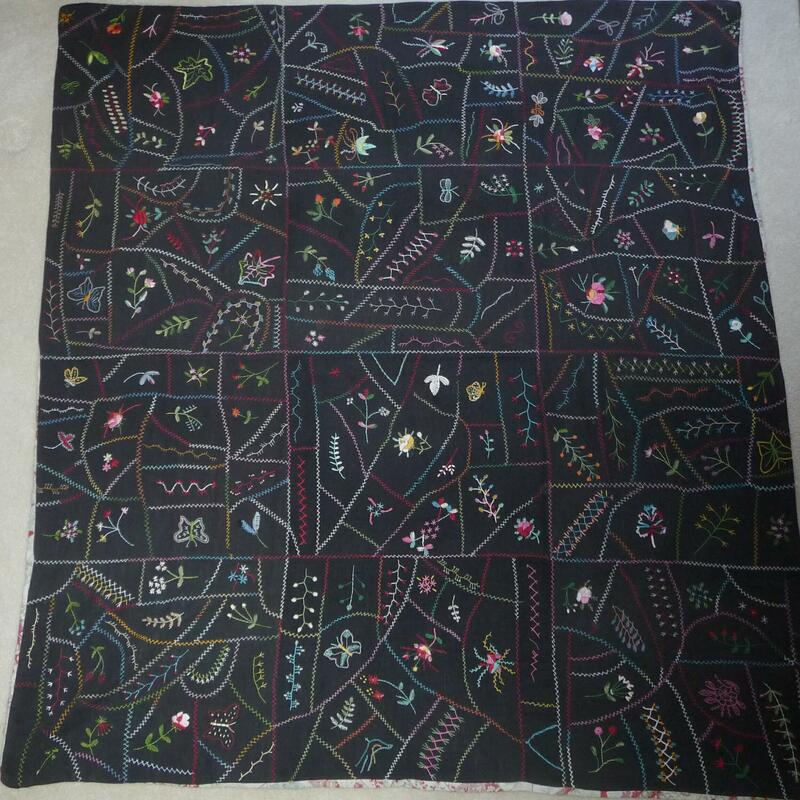 The back is a late 1800's homespun wool blanket and is bordered by black fabric. 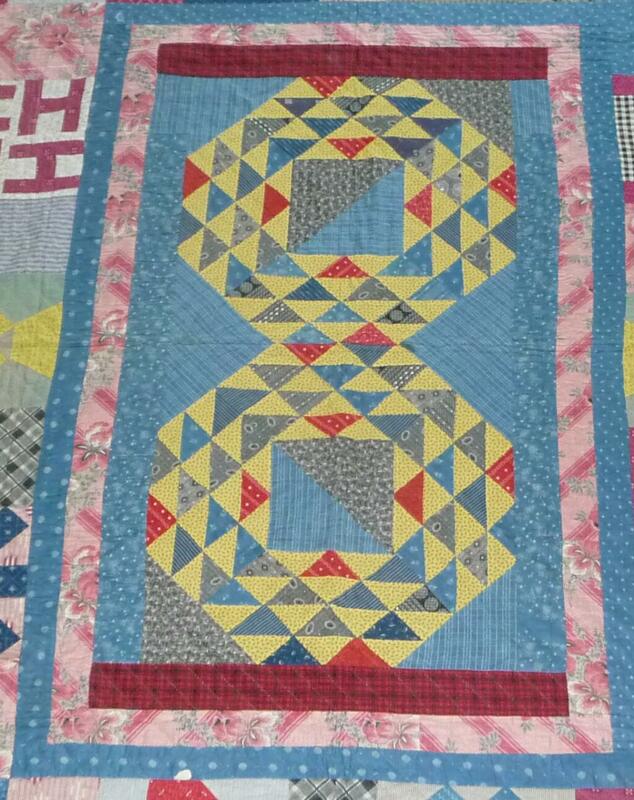 The quilting outlines every block at 8 stp inch. 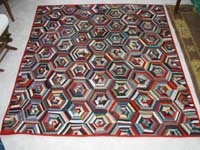 Quilt/Comforter 1940 - 49" x 78 1/2"
This all wool quilt/comforter is made from light weight wool suiting fabrics in red, grey, brown and black. Expertly machine pieced with an exceptional half moon scalloped border of the same fabrics, no batting and a red polished cotton back. The back and front are joined together by a hand stitched knife edge. 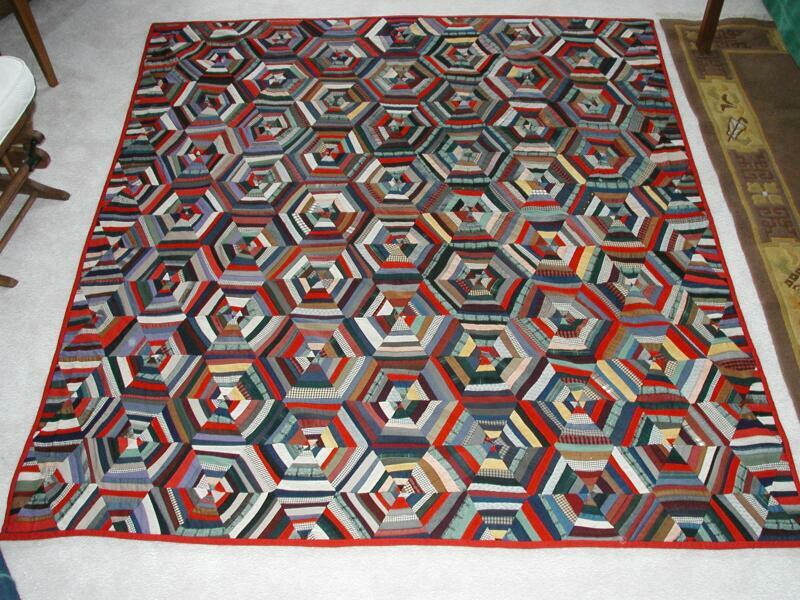 This exquisitely assembled quilt top is 100% Merino wool made from 2” hexagons in 1950 in Missoula, Montana. 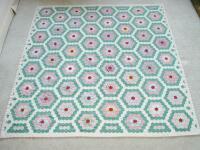 The hexagons are made from heavy Merino wool in blues, blacks, grey and browns. They are whipped stitched together in the back. There are no stains, tears, moth holes nor seam splints. Due to the weight of the top, it may never be backed as it lovely to see as it is. 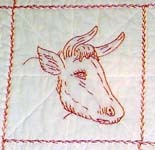 The picture is shown with one edge of the top folded over on its self. The colors are very pale on the computer monitor and are rich dark colors. 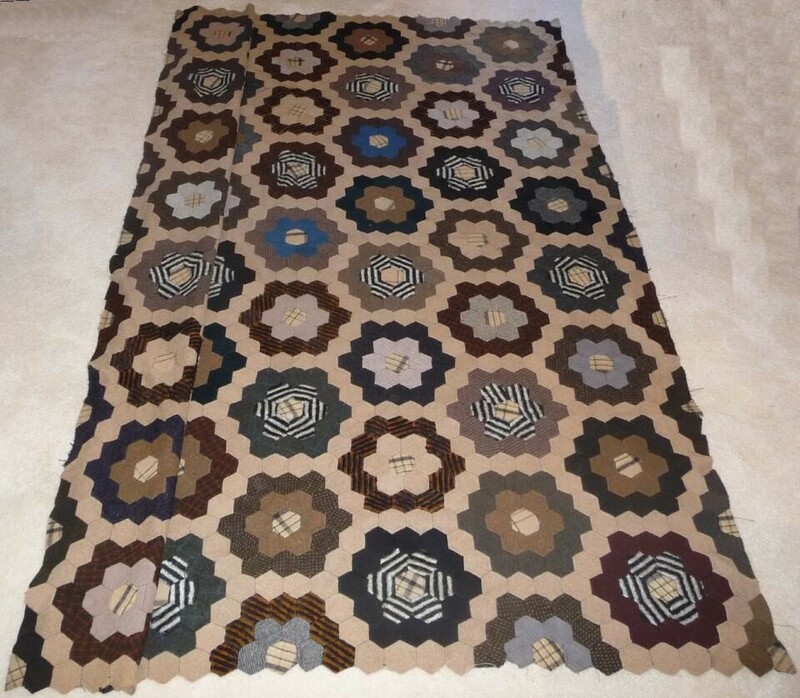 The white hexagons are actually a tan. 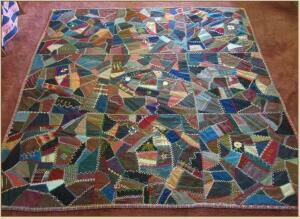 This all wool quilt is embellished with red and yellow yarn embroidery stitches that are beautifully done. it originated from Pennsylvania – maker unknown. 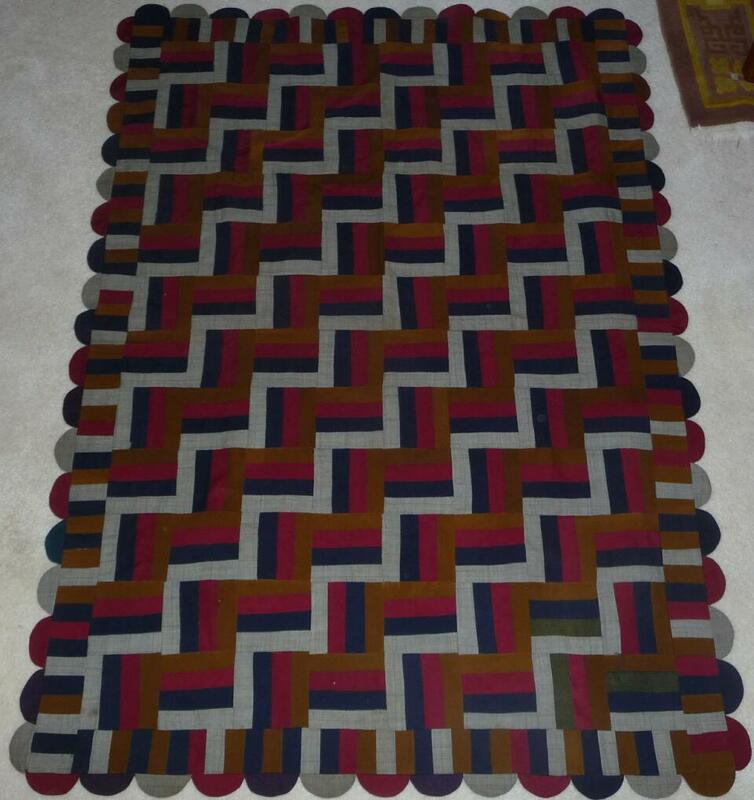 This appears to be a top only but was made to drape over furniture or hung for display. The top wool is foundation pieced on various plain and sateen cottons and then the 1/4" seams are whipped stitched to keep them from fraying and being caught. A few moth holes were expertly darned and the binding is a bright red cotton to match the bright red yarn in the squares. Because the yarn pieces are quite long in some places and very loose it would not have been useful as a bed covering as the decorative embroidery would have been pulled out or torn. Otherwise it is in great condition and clean. 8. Log Cabin Courthouse Steps – 1920s - 62" sq. This quilt is composed of all solid color light weight/women’s suiting wools. Grey is the neutral color that makes the primary reds, yellows, royal blues and green pop. The appeal of this strong positive-negative graphic is enhanced by the use of the solid colors (not prints) in the 1"wide log strips. The batting is a thin flannel and it is hand quilted in 10 stitches per inch in horizontal and vertical lines. The back is dark red polished cotton and is brought over to the front to finish the edges. It is in excellent condition with no stains, tears, odors and very clean. 1920s - 2014 - 60” sq. 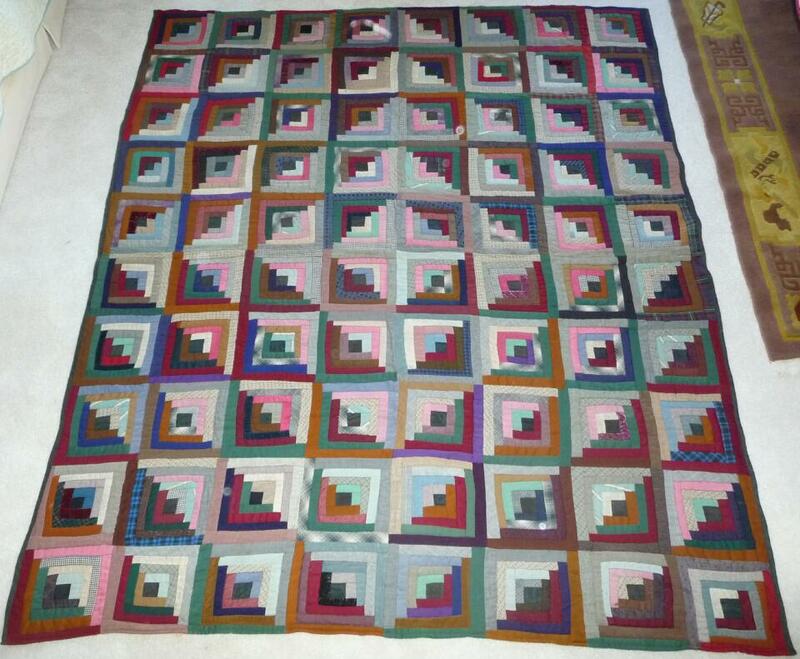 This all wool quilt is composed of 36 fan blocks made in the 1920s. The other wool fabrics are 30-60 years old. There is no batting and the back is a teal lightweight wool which matches the binding. 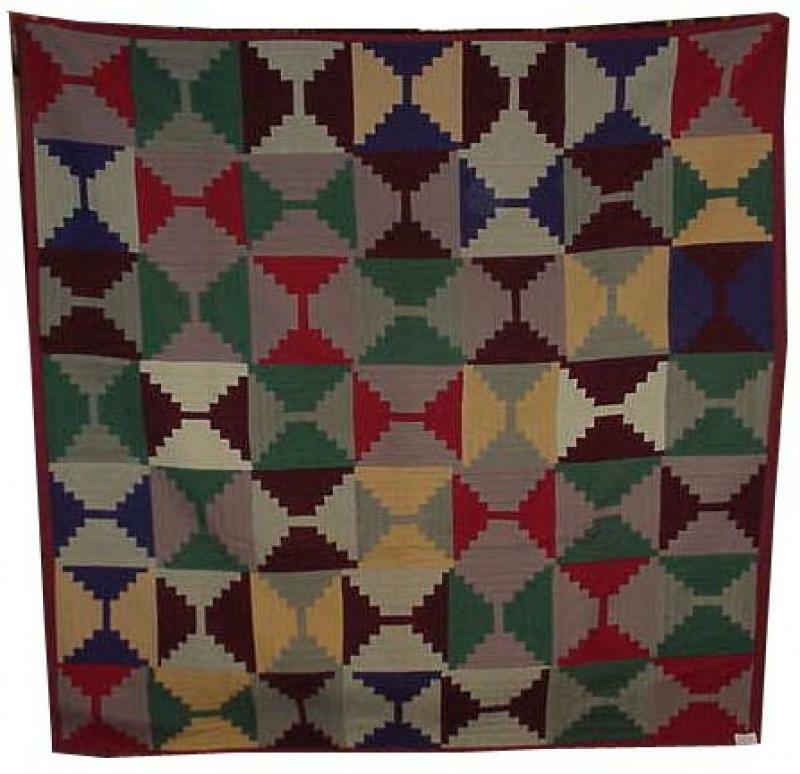 This Barn Raising Log Cabin Quilt has a nice assortment of Wool Fabrics, uncovered recently from Berks County, Pennsylvania. 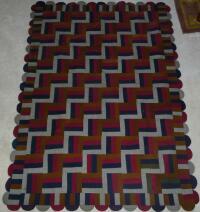 It dates from the Late 19th Century to Early 20th Century with all fabrics being strong and sturdy. It has hand stitched quilting and machine stitched binding. It is in crisp, never used unwashed condition. 11. 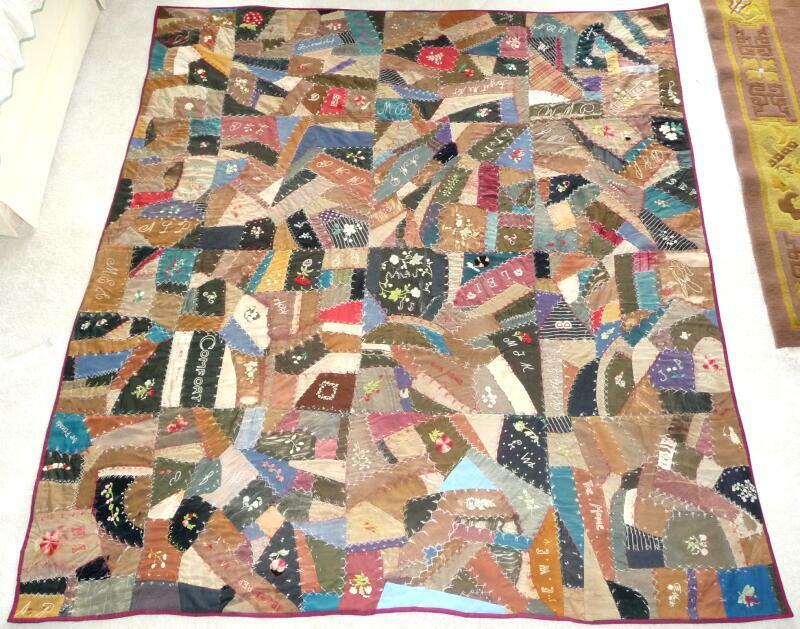 Stump work Quilt - 1900 - 42" x 63"
This magnificent lap size quilt of 70 blocks was popular with the Pennsylvania Dutch quilt makers from the late 1800s to about 1930. 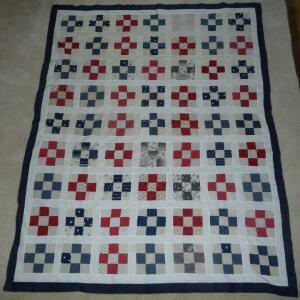 The quilt was used for decorative purposes only and is made from navy blue and grey 6" wool blocks. 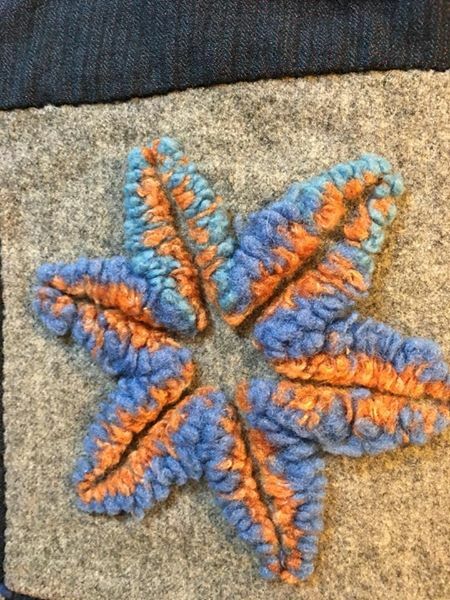 There are 35 grey blocks with a Stump work star each in multicolored yarn. The back is beige light weight wool and binding a brown cotton and tied with dark blue yarn with the knots on the back. Excellent condition - no holes. tears or stains. .
1. 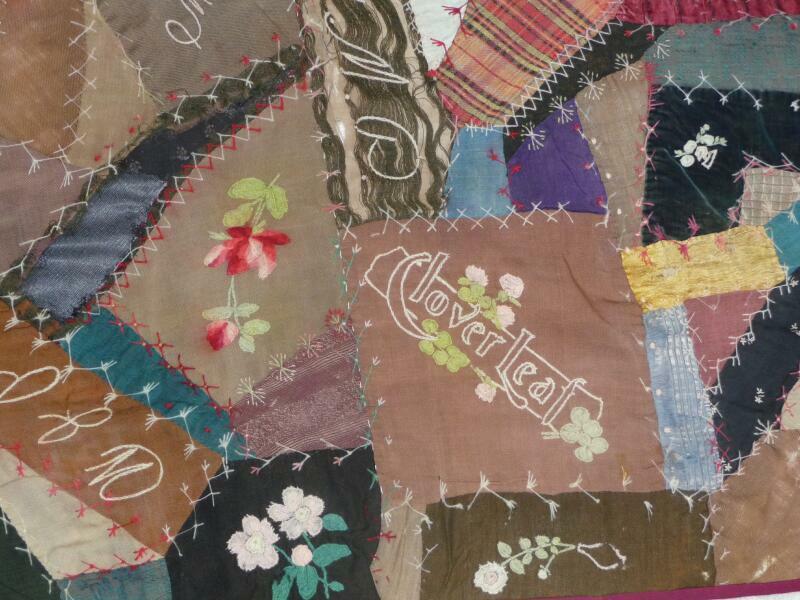 CRAZY QUILT - 1895-2008 - 67" x 67"
This crazy quilt was made Oct 5, 1895 from denim, cottons, old work clothing, etc. Extensive and exquisite embroidery work was done in floss and yarn with motifs of words, such as Comfort and Cloverleaf, flowers, initials and animals. It was badly damaged and dirty and needed a complete restoration to make it whole again. That was not possible but laundering, decent repair work and reassembling has put it back to much of it's faded glory. Lightweight 100% cotton batting was added, the old clean back was reused and a dark red binding finished the piece. 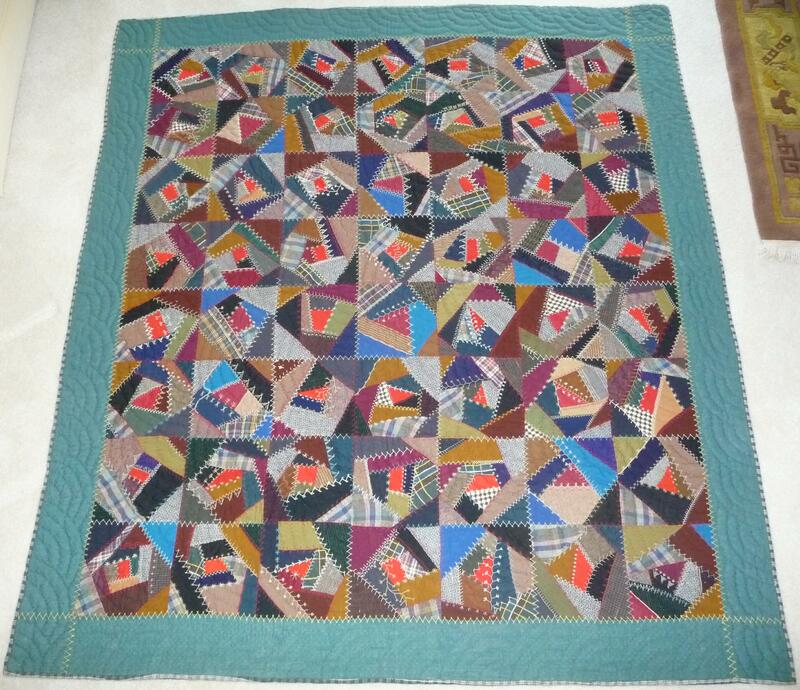 No provenance was found but a testament to a lady without means but lots of skill and love were put into this charming, sweet little quilt. 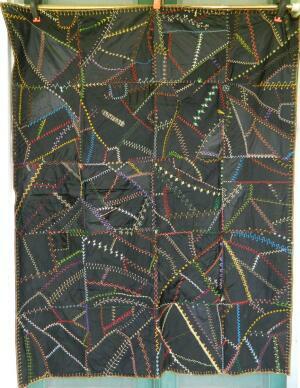 This is a stunning crazy quilt of all black silk with multicolor embroidery stitching. 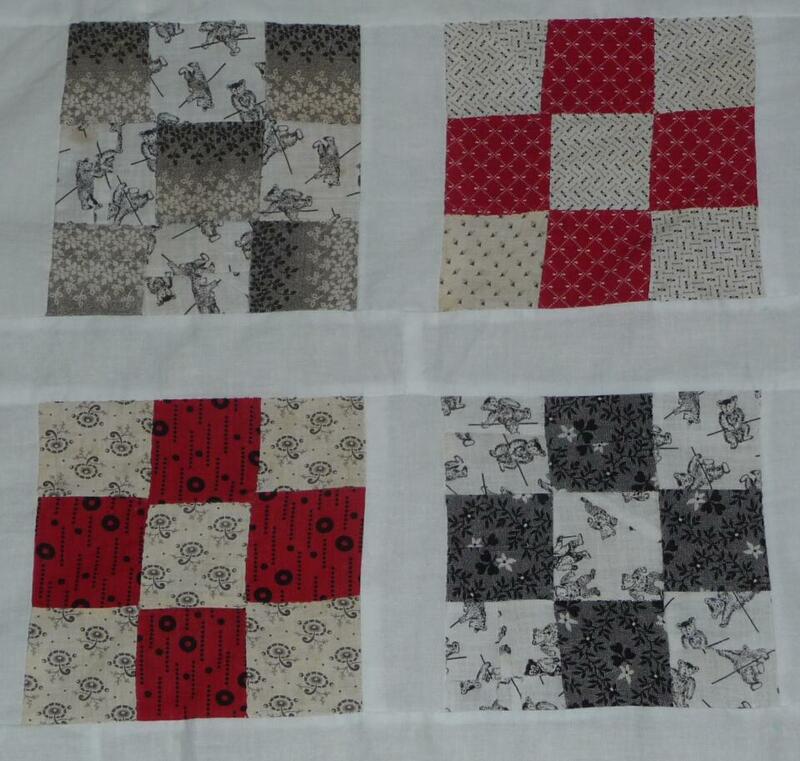 The black silks are 20 blocks pieced together in good condition. There are dozens of different embroidery stitches done in silk and cotton floss with exquisite detail. Made by Virginia Hallett Hardesty nee Ginna, 1928-2014 in Ithaca, NY. 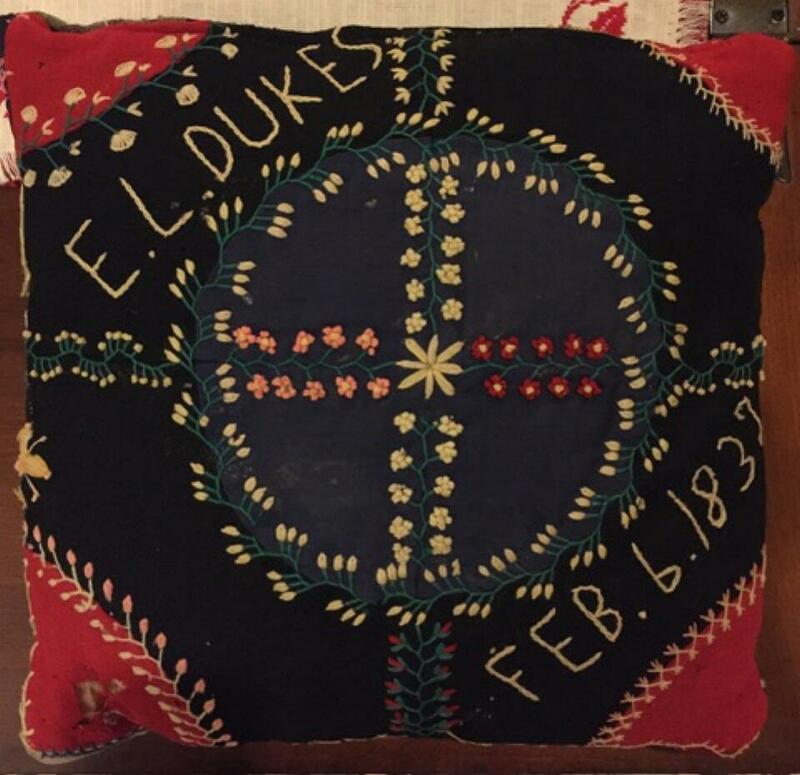 This quilt is dated with 3 different years, 1888, 1889, and 1890. 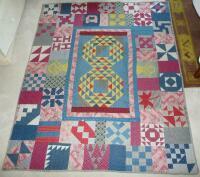 When you look at the 9 blocks making up the quilt each horizontal row is dated, i e., lowest row is dated 1890.. The center row of blocks is dated 2 times 1888, & finally, the top row of blocks is dated 1889. 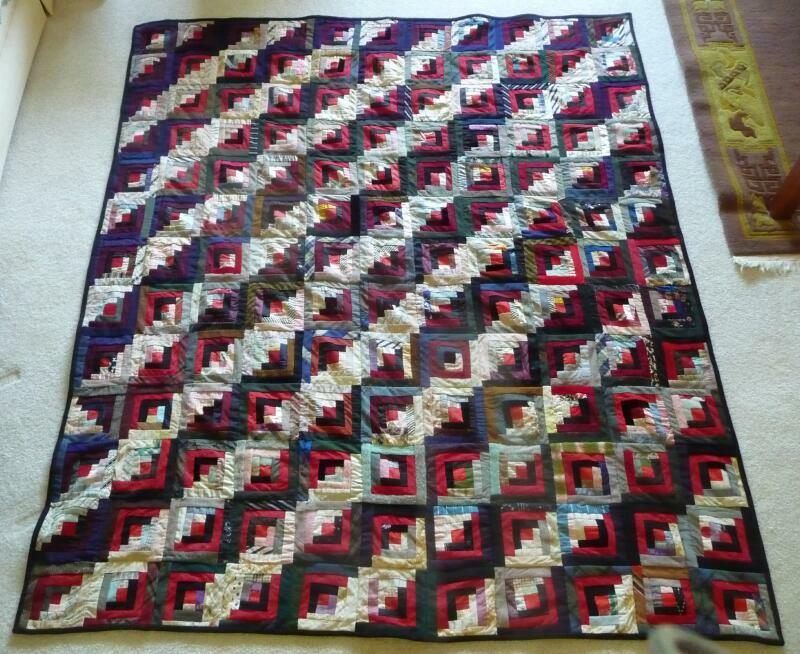 She put 3 blocks together each year when each of her children were born. 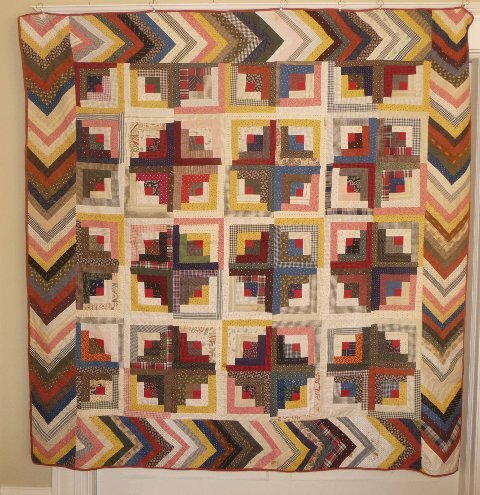 This wonderful old quilt measures 70" x 73" and is made with lots of wool & wool blend fabrics, in brown, shades of blue, tan & beige, burgundy, black, red & more. There are some solids, plaids, brocade designs, stripes, a pretty paisley & others. Maggie did all of this wonderful embroidery with wool thread or thin wool yarn. There are many different embroidery designs done in many different colors - flowers, birds, trees, etc. She even embroidered the binding, very unique! Maggie Emilye Trueman Potts was from Clinton, Tennessee – 1868-1891. She made 3 blocks after each child was born and died one year after the last at age 23. Husband’s family (John Potts) was from Cheshire, England. 4. 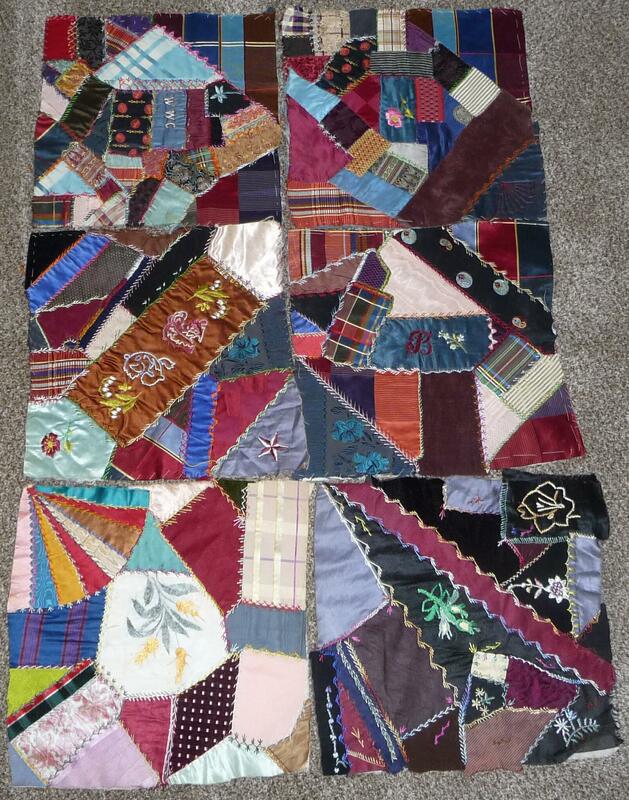 Crazy Quilt Blocks - 1900 - 12" x 12"
These crazy quilt blocks measure about 12”x12”. The pieces came from men's old ties, silks, satins, velvets and brocades. Many designs are embroidered in the sections and all seams have outline embroidery. There are no stains, faded fabrics or tears. 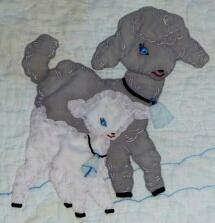 There are two embroidered wool quilts here. 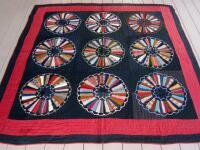 The multicolored motif is in my collection and the black and white belongs to the American Folk Art Museum in NYC. 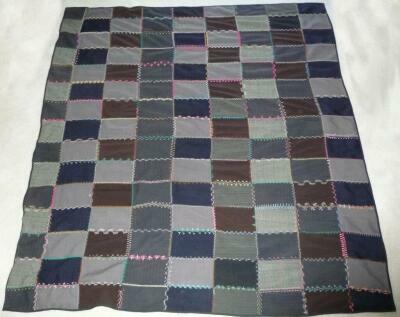 This black gabardine wool quilt is composed of 16 - 20” sq. 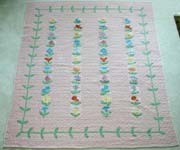 blocks with exquisite multicolored embroidery of flowers, butterflies, bugs, leaves and random stitches. There is no batting and the back is a two piece cheater cloth cotton. One tiny hole in the black was expertly darned and the quilt is otherwise in excellent condition. All white embroidery work on black wool. There is no batting and the back is cotton with the front and back joined by a “knife” edge. 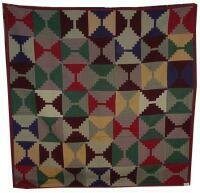 Barb Garrett explains on how these quilts may have been made. 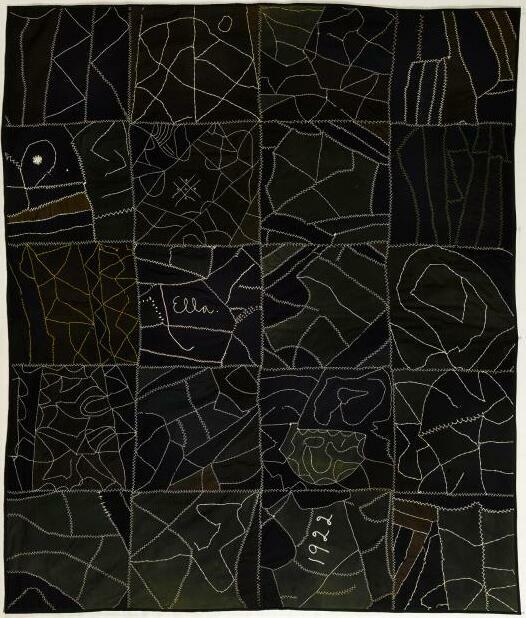 “It is now in the collection of the AFAM - American Folk Art Museum - in NYC. Both came (Ella 1922 and mine) from the same home in Lancaster, PA and all we know is that ELLA made one in 1922 but only signed the one. 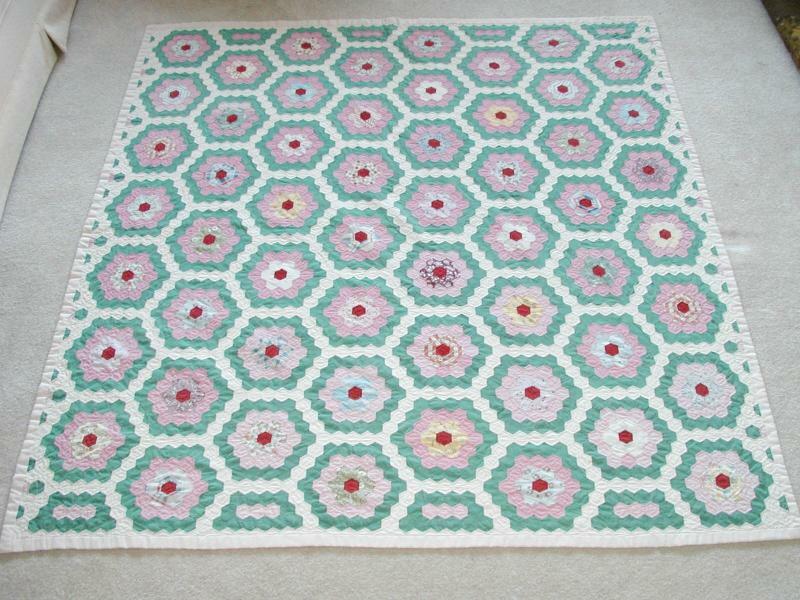 It almost looks like the Ella quilt is "step 1" -- "stitch lines of embroidery to simulate crazy piecing". 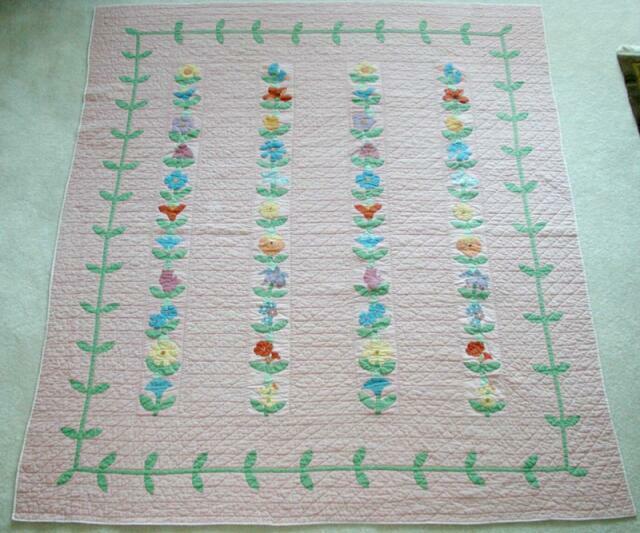 And your quilt includes "step 2" -- "embroider floral motifs in the empty areas to simulate crazy quilt designs". 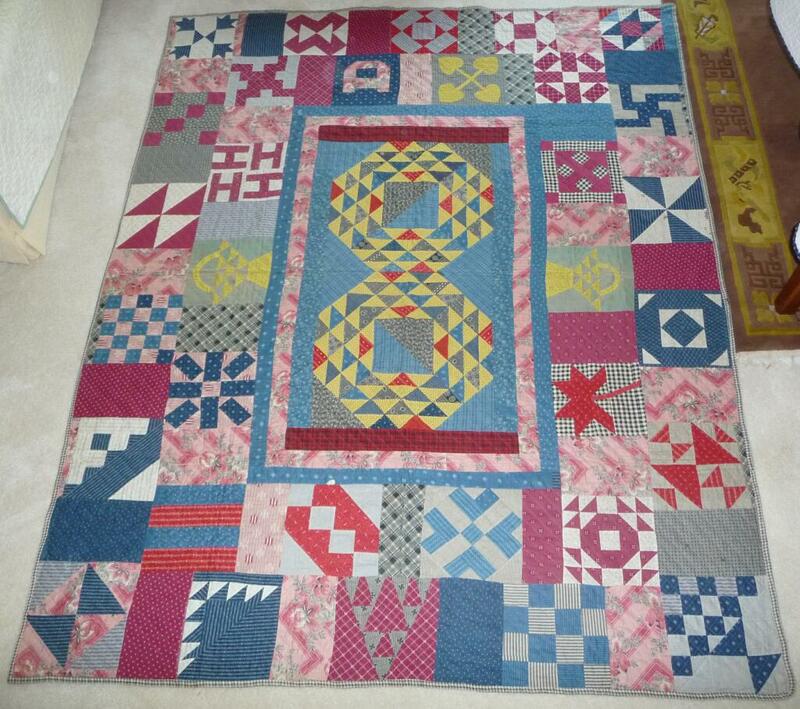 A very interesting combination of quilts, and I would agree with the circa 20s date for both of them. 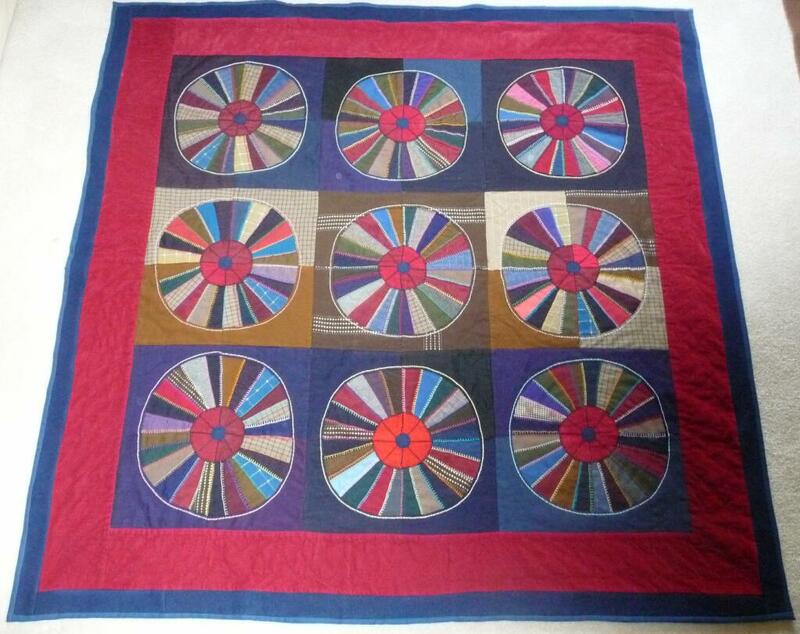 From my research in this area, that type of wool crazy style quilting is more 20th century than earlier, and the PA Germans were enjoying continuing the crazy style of embroidery long after it lost popularity in the main culture. 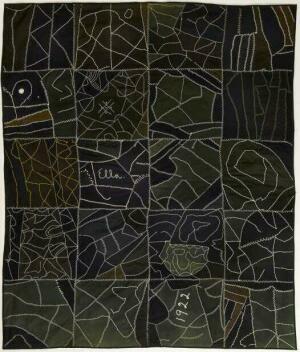 I've seen Ella's type of embroidery on quilts/tops from the 20s, 30s and 40s worked on wool, cotton and rayon." 6. Crazy Embroidered Quilt - 1901 - 62" x 70"
The quilt is entirely hand pieced and hand quilted with a shell quilting pattern over the entire quilt at 7 sti. 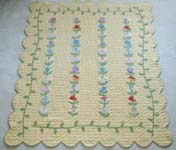 The outer border is 4-1/2" wide and done in a teal blue wool with a tiny weave pattern of flowers. 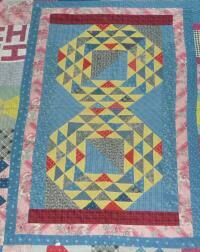 Corner blocks are created by the use of embroidery work in bright yellow that joins the 56 squares to the teal border. The backing is a printed flannel in dark teal blue and rose with white. 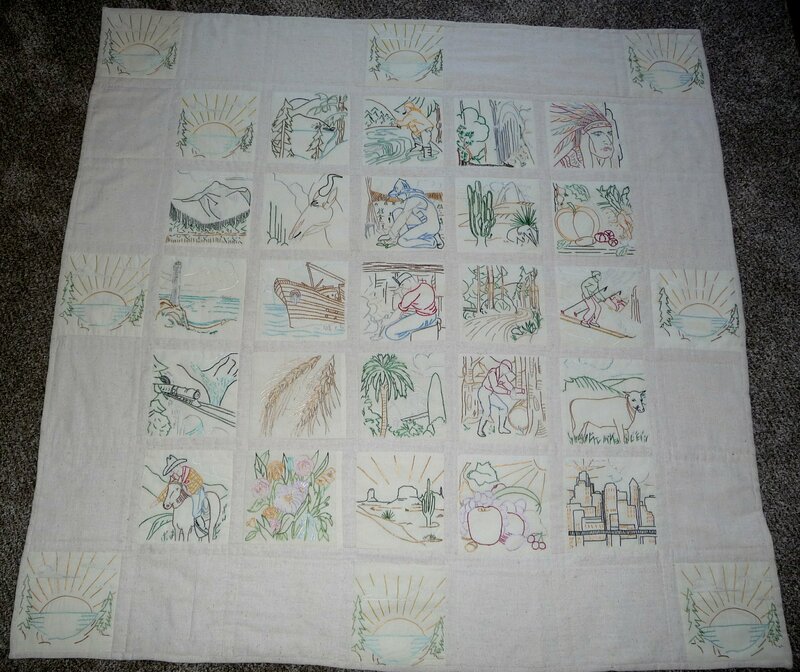 The quilt is in excellent condition with no tears, stains or loose stitches. 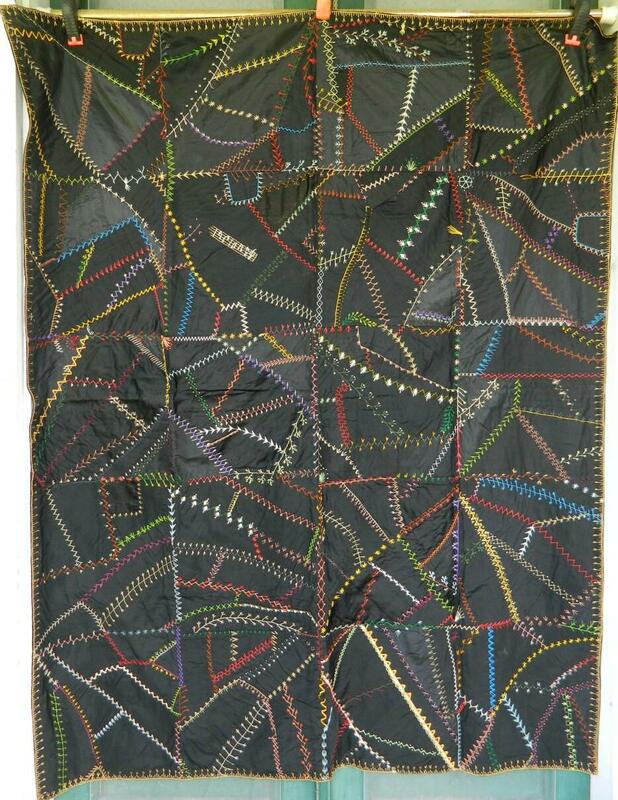 A great dated 1884 crazy quilt made with silk and velvet fabrics. It is loaded with figures such as a hand, shoes, boots, cross, shield, mittens, fan, horse, butterfly, moon. There are hand painted details of shells, fish, frog, etc. and a Congressional Ribbon for J. Thomas Spriggs. One patch has the name Snooper - maybe a dog? It is almost invisibly tied. 3 pieces show shredding; one is very tiny and the other two are not distracting. A 2 1/4 inch blue velvet border is in excellent condition. 1a. 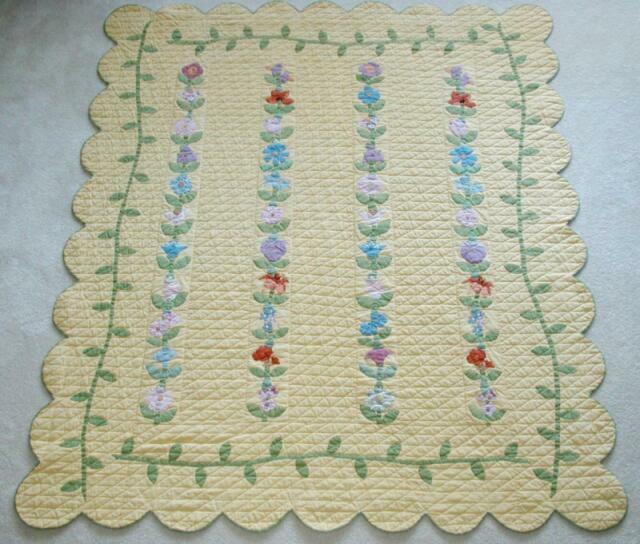 Whig Rose Top - variation - 1860 - 80" sq. According to Leigh Fellner “The top called "Tea Rose variation" is actually in a pattern commonly known as Whig Rose. Both its form and name appear to originate in an overshot weaving draft by that name. The format is always the same: a central bloom (often similar to the single bloom of the Rose of Sharon pattern) with four branches, each of which typically has two smaller flowers or buds. 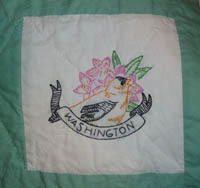 Occasionally parts of Whig Rose quilts' blooms were made by ruching, but more typically this design was completely appliqued of flat shapes. 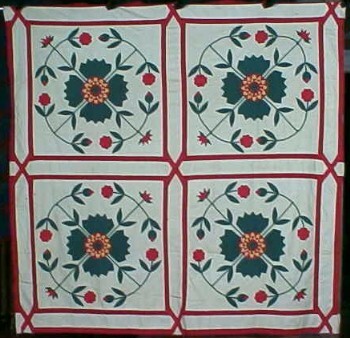 This format was most common during the earlier (1840-60) half of the red/green quilt fad. 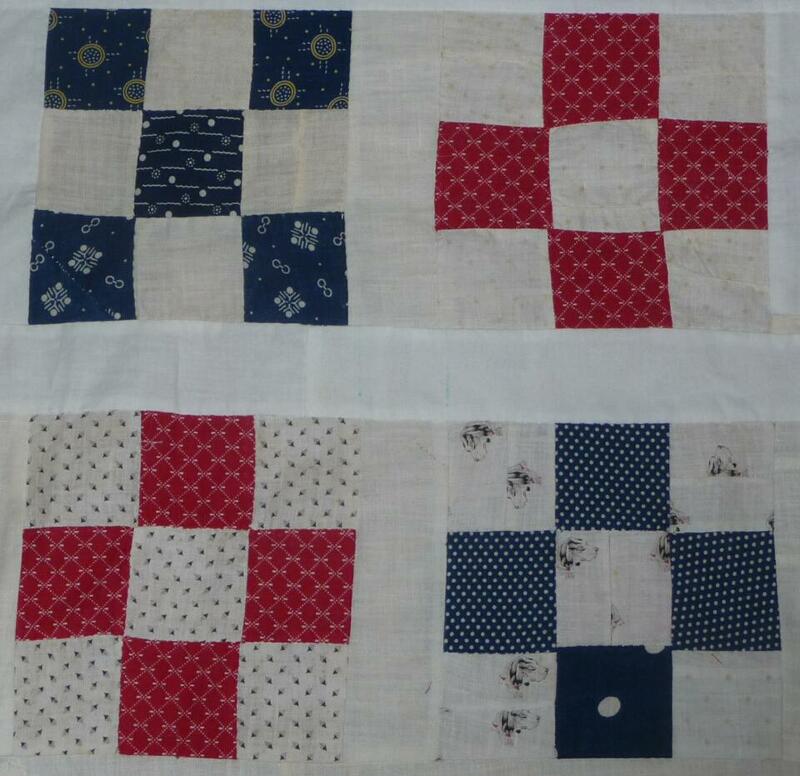 This red, white and blue quilt top consists of many late 19th and early 20th century fabrics in the 56 blocks. Most notable are the “Conversation Prints” of the early 1900s which are composed of tiny motifs of dog heads and teddy bears representing Teddy Roosevelt. It was done by hand and some treadle machine stitching. I acquired these 30-12" sq. muslin blocks from eBay which were badly stained with oil, aging and who knows? They were hand drawn in charcoal pencil by a traveling artist for Mamie Dorney of Allentown, PA. in Sept-Oct 1906. They consist of 7 people, 6 animals, an envelope complete with 2 Cent stamp and post mark, a Bible, Church, Gravestone and 13 other household items and flowers/plants. 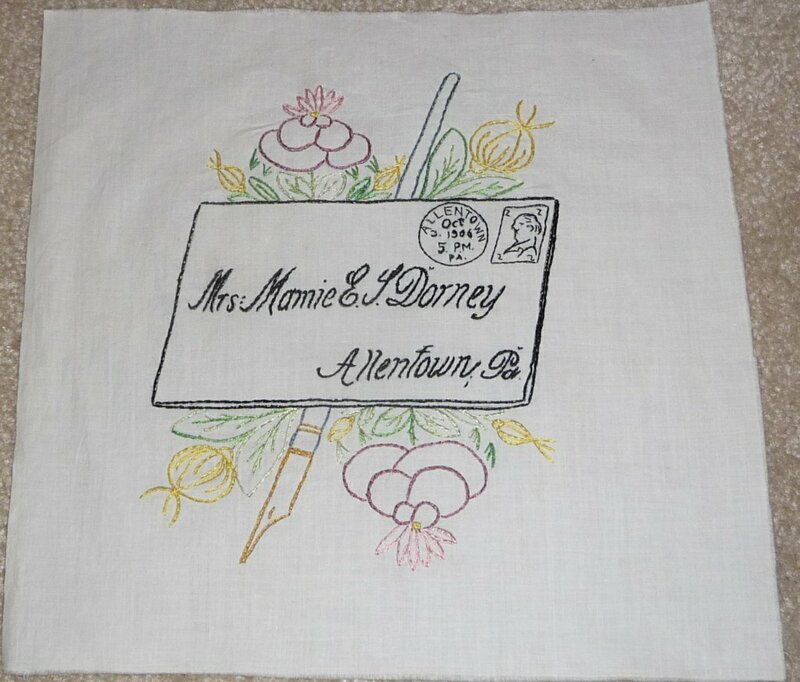 Mamie is the niece of Solomon Dorney who started the Dorney Park in the mid 1800s and is now the famous Dorney Amusement Park still in Allentown, PA. By researching thru census records and then zabasearch, I found the current Mamie Dorney (there are a lot of Dorney's in PA.). Her grandfather was Solomon's brother, Raymond. He and 2 other brothers all helped to develop the park as it is today. I called Mamie and the Manager of the Park and now both are actively watching my progress with these blocks. Since the staining was so extensive (a few pix are shown below), I used an ultra fine line permanent ink Micro pen to capture all the lines in each block and then beached and soaked the blocks until they were white once more. 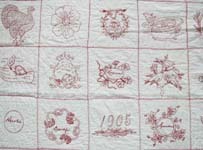 At present I have embroidered all 30 will assemble into a quilt with period fabric for sashing and back by the end of this year.